You are currently browsing the category archive for the ‘County Clare’ category. Keating’s Bar & Restaurant at the Kilbaha pier. 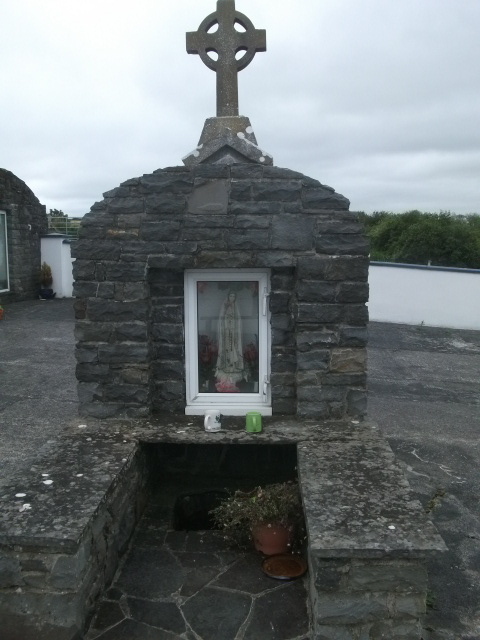 Our first Easter as residents of Lisheen, Kilkee, County Clare, Ireland – on the Loop Head Peninsula, began with a Sunrise Easter Mass at the pier in Kilbaha, the remote, last stop village before reaching Loop Head and the light house. Mass began in the dark, at 5:40 a.m. to be exact, and ended in the light. The between time had the waves of the Shannon Estuary lapping against the shore, song birds waking up, prayers and poetry. And as we walked back to our car in the morning light, a herd of cows was gathered along a wall at the roadside observing the strange morning event, as though they were wondering what all the fuss was about! Any of the three main routes home from this enchanted spot on the Peninsula is a pleasure to drive, each with its own personality. But on Easter morning we chose the most dramatic route, the western coastal road with its magnificent cliffs that rise up from the Atlantic Ocean and thrill at every turn with stunning scenery that still takes my breath away, though I’ve driven it many times now. I may no longer be surprised by the view, but the raw, wild energy is always present and the ever-changing weather and light of West Clare creates a new beauty that still amazes me every time I journey along this road. This particular morning it was cloudy and grey with a slight mist hanging in the air. A ‘soft day’. Soft where we were anyway, but down below it was anything but soft, with white waves crashing, thunder against sharp rock and who knows what wild creatures hidden from view. Quite a contrast to the softer waves of the Shannon Estuary that played in the background of the sunrise mass we had just attended. Our peace was shaken but we were now awake and energized to face the day ahead and even pushed along to face our future, as life in West Clare moves forward for us with its many delights, and not to be ignored challenges. In September of 2016 our cottage retreat became our full-time home. Our first Easter in our cottage home. All is quiet today and the sky is bright above my Chicago suburb. No more sounds of plows in the streets as they try to keep up with a blizzard that dumped over a foot of snow on us. 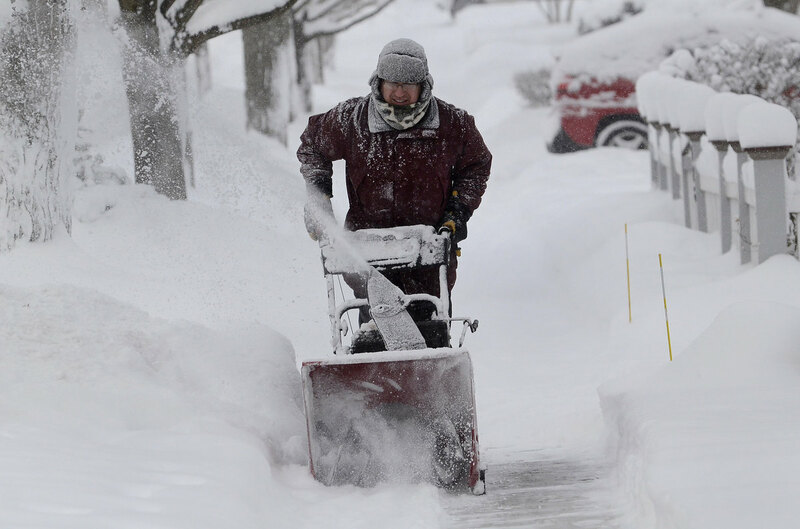 No more scraping of shovels or drone of snowblowers going up and down driveways every couple of hours. The snow has stopped and the streets and driveways are as clear as they’re going to get. But with this storm’s one-two punch a brutal cold has settled in that explains the silence. As I type this it is -16 degrees Fahrenheit outside (negative 26.6 ºC)! And this does not tell the story of our windchill, which is much colder and describes how the air actually feels as these brutal temperatures, in the form of wind, hit your body. I haven’t heard a car pass by on the street for hours because those who can, are staying inside their homes. The local schools are closed and even my husband’s employer told him to stay home today, a phenomenon in itself! The birds are silent as though trying to go unnoticed by this biting cold and the squirrels that live in the two trees on my parkway are nowhere in sight. Hopefully, they’re snuggled up close together keeping as warm as possible. We only venture outside to walk our dog, who we dress in a coat with a turtleneck sweater underneath. Even wearing this get-up, he comes back inside shivering, feet frozen and tiny snowballs clinging to his fuzzy fur. Seán is a Bichon Frise and not made for this weather. Meanwhile, it is about 50 degrees Fahrenheit in Ireland. But, a milder temperature does not mean that Mother Nature is taking it easy on them. 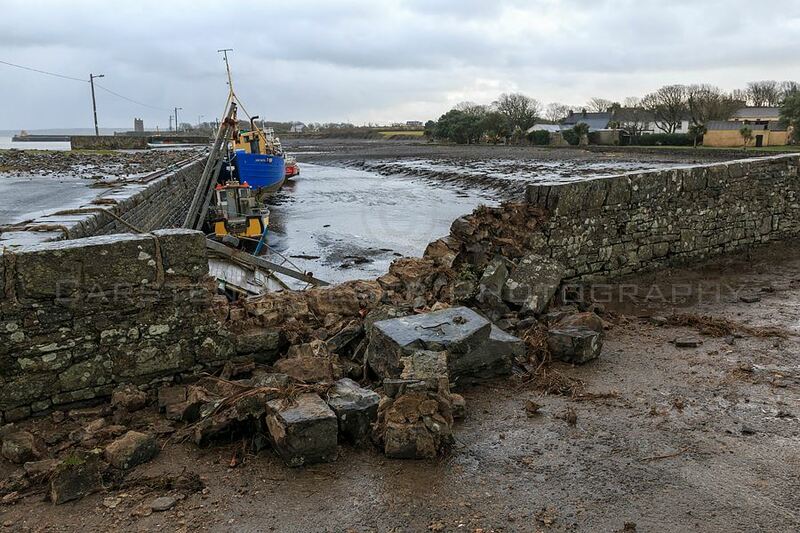 Lashing rain and 120 km/h winds have wreaked havoc with damaging waves and floods along the coast and across the country from storms that have come repeatedly since before Christmas. 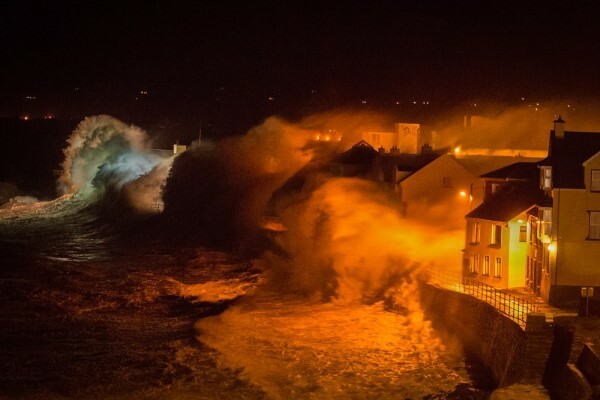 Tides rise and huge waves explode against the shores of the Loop Head Peninsula and all along the coastline taking down sections of stone walls, washing over roads and flooding promenades. The howl of gale-force wind and the thunder of 40 – 60 foot waves would be invigorating and exciting to witness if it were not so destructive. I imagine the local people snug inside their homes having battened down the hatches, hoping for the best and afraid to venture out to see the damage each time it quiets down between storms. My house on the Loop Head Peninsula just outside Kilkee is inland enough that the waves themselves can’t reach it, but with wind like that and the lashing rain, I am preoccupied with concern for its wellbeing. A huge weight lifted from my shoulders when we received an email from the local man who checks on the house for us. Reading the words, “You’ll be glad to know that Teach de Búrca stands proud with no damage done to it or any of the outbuildings,” was such a great relief that I felt a surge of optimism and a special warmth for my little Irish house as it continued to brave the storms. So here I am surrounded by snow and cold so dangerous that I won’t be leaving the house today – not even for my mocha! The cabinet doors under the kitchen sink are open to allow heat to surround and protect the pipes from freezing as are the doors around water pipes in the basement. Curtains drawn and blinds closed through the night in an attempt to keep out drafts, are now open to allow the sun to magnify some heat through the windows. The furnace is on overtime doing its best to keep us warm, so far so good. I am here and I know what is happening and what I need to do. But since I’m not in my County Clare cottage, I can’t see for myself if all is well after each storm so I am haunted by phantom sounds of crashing waves, howling wind and the rattling of my red half-door. I have found another reason to like the Irish people and it happened in a pub. After Eoin’s tin whistle class on Wednesday night we wandered over to a nearby pub to hear his teacher performing traditional Irish music on the concertina, accompanied by his sister playing the harp. 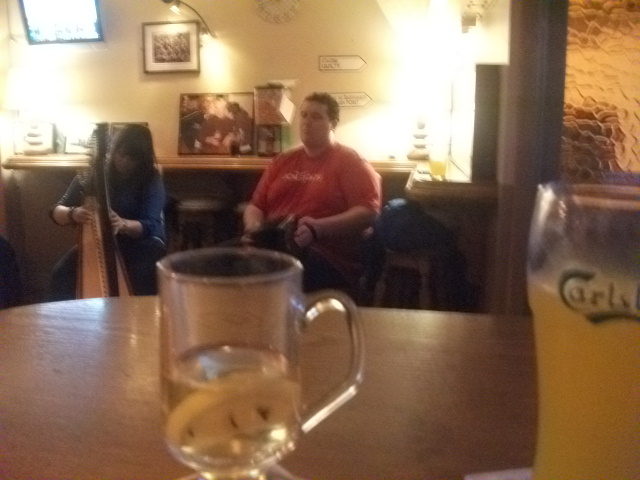 I ordered a hot whiskey for myself and a Rock Shandy (1/2 Club Orange and 1/2 Club Lemon) for Eoin and we joined the small group of people in the pub for the music. A television on the wall, albeit with the sound turned off, kept Eoin happy with a dose of the Olympics he has been so sorely missing due to the absence of a tv in our cottage. As for me, the lovely music and relaxed banter with the pub owner and the musicians between tunes, was a perfect way to wind down the day! At some point the subject of crime came up and someone in the room quipped about how insignificant matters are reported on the local radio station as though they are of great importance, such as the recovery of a missing dog or a truck stalled and blocking a road in a town of only a handful of houses. I mentioned that they’re lucky that such small things are worth reporting here because in Chicago there is enough crime to report about to keep the small things well off the news! When someone then mentioned how relatively low the crime rate is in this part of the country, I blurted out my usual superstition, “Knock on wood!” No sooner did the phrase escape my mouth than every person within earshot immediately and instinctively – reached over, in front of, beside, or even behind themselves and knocked on whatever wood furniture or molding was closest to them! Then everyone continued on with the conversation without missing a beat. It was so unusual to us that even Eoin remarked during the journey home, “Mom, did you see how everyone knocked on wood when you told them to?” …These are my kind of people! 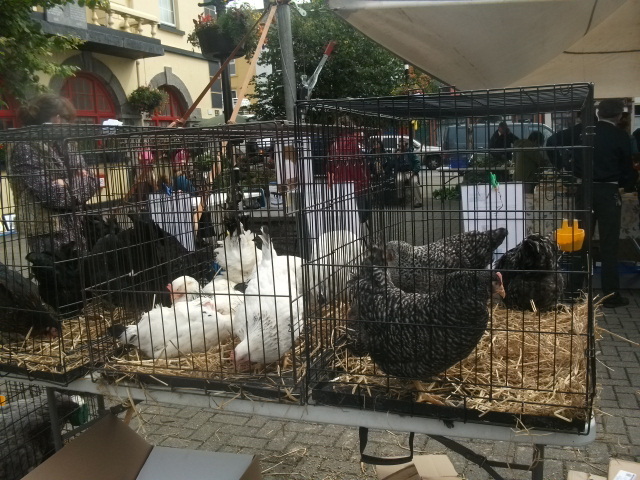 Having made it back to the Kilrush Farmer’s Market, I made a point to bring my camera along and was happy to find that the chickens I was so delighted to see there a couple of weeks ago were back! 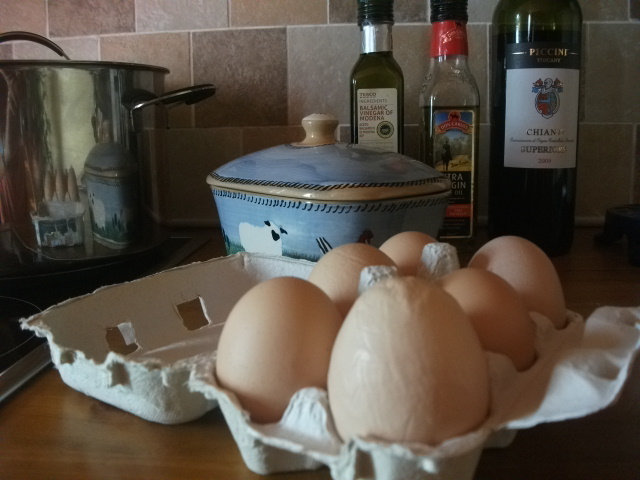 And, although I again controlled the urge to buy a hen, I came a bit closer this time and bought some fresh eggs from a boy who appeared to be about the same age as Eoin. As professional and businesslike as this young man was, he was still a boy, and I watched as he eagerly pushed forward a particular half-dozen carton, which he seemed to favor, trying to sell it to an elderly man who was ahead of me at the stand. I noticed that the carton contained an oddly shaped egg prominently perched at one end. However, the man didn’t acknowledge the boy’s hints and instead took the carton closest to him. When my turn came I couldn’t resist the boy’s enthusiasm for this particular half-dozen. He inched the carton toward me and though he didn’t guarantee it, he told me that the oddly shaped egg might contain a double-yolk! He said this with the bright-eyed enthusiasm of a child who is not yet bored with the subject of double-yolk fresh eggs, in spite of having to sell eggs at a farmer’s market stand – and probably help gather them in the morning. Well, as I had promised Eoin earlier in the day, for dinner that evening I made him a bit of an Irish breakfast of eggs and black and white pudding. Of course we had to use the egg with the potential double-yolk and as I got ready to crack it open Eoin stood watching hopefully – and with the same enthusiasm that his peer exhibited when selling it to me. Unfortunately, all this anticipation was rewarded with only a single yolk. Sometimes an oddly shaped egg is just an oddly shaped egg! When we arrived home tonight I turned off the car and we sat parked in front of the house listening to this beautiful song playing on the radio, while gazing out across the misty bog just as the grey of the day was darkening into night. It always amazes me just how perfectly Irish music fits with the Irish landscape. Yes, we had another day of what has been the punch line of the summer, “forty shades of green replaced by Fifty Shades of Grey!” However, fast becoming an expert at trying to make the best of the challenging weather situation, this afternoon I purchased tickets to a show staged at the Cultúrlann Sweeney Theatre that resides in the newly renovated library in Kilkee. Tonight, Crack’d Spoon Theatre Company performed “Curtains Up”, a family friendly variety show, that was a delightful mix of comedy, dance and live music featuring local children, teenagers and adults. The comedy provided hearty laughs – and a few eye-rolls, the talented, and sometimes quite nervous, children were darling, the adult performances were very professional and the live music was an unexpected treat tonight following Willie Clancy Week. Some of the night’s highlights were; two young boys dressed as chimney sweeps performing an exuberant sean-nós broom dance; a Monty Python-esque town doctor comedy skit; two excellent male singers performing a “Simon and Garfunkel” tune; traditional Irish music performers playing and singing several Irish classics; a hilarious, quite large, older man dressed as a ballerina performing with a group of tiny, adorable little girl ballerinas, who seemed to take his presence for granted as just part of their group; and two “cleaning lady” comediennes who punctuated the acts with their banter and short spurts of set changing followed by numerous breaks for tea! 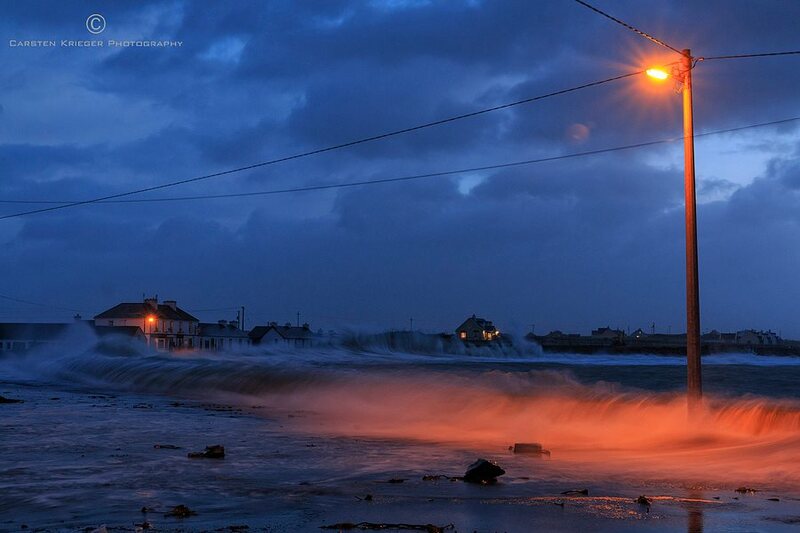 All in all a great way for a mom and her 10-year-old son to spend yet another rainy Kilkee evening! This local black box theater is a great discovery that I hope we get to enjoy a lot more of in the future. 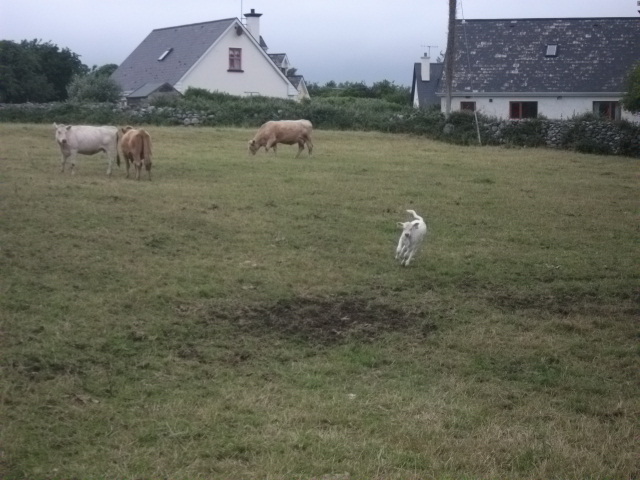 I also must mention something that I have observed at every performance I’ve attended in County Clare. This is the particularly charming practice of offering as refreshment, fresh brewed tea in ceramic mugs or, as they did tonight, in ceramic teacups with saucers! This was even done in the large venue for the concerts in Miltown Malbay last week. In that instance at one point the emcee of the show politely asked that people who have finished their tea, “please pass your cups down to the end of the rows so that they may be collected.” I love this civilized, homey touch and I hope it is never replaced with the usual disposable cups that are the norm everywhere else! Musicians, singers, dancers and Irish traditional music fans, like me, have come to Ireland from all over the world to enjoy Willie Clancy Week. 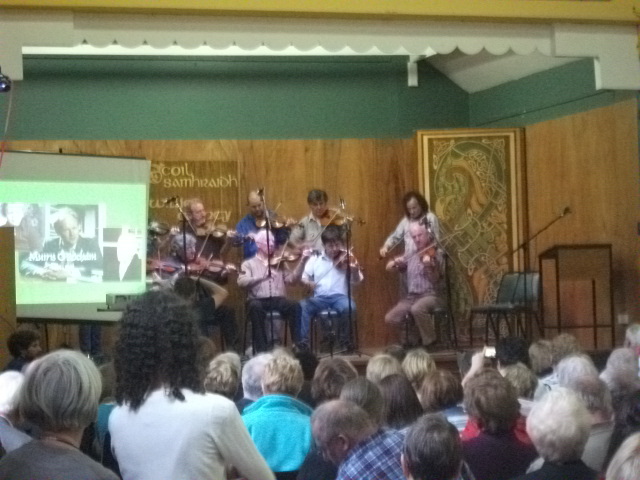 An 40ú Scoil Samhraidh Willie Clancy, the Willie Clancy 40th Summer School, a.k.a. 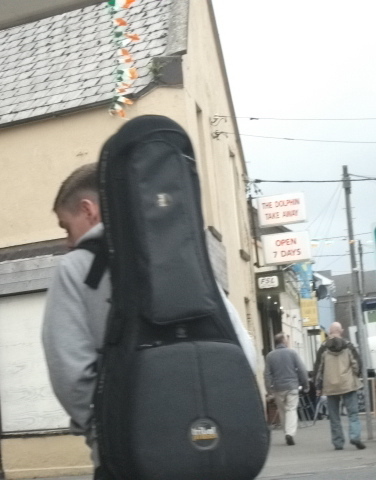 Willie Clancy Week or the Willie Clancy Festival takes place annually in the town of Miltown Malbay. Not only is this Ireland’s largest traditional music summer school, but it offers a week of recitals, céilithe (traditional dances), lectures and exhibitions, all open to the public. It is basically an intensive, week-long celebration of traditional Irish music and culture. Lucky for us, Miltown Malbay is just a half hour from our cottage so today Eoin and I made our first, of what I hope to be a few, trips to the festival. Not only was this a feast of Irish traditional music, punctuated by the most Irish language speaking I’ve ever heard while here, but it was a treat just to see so many people of all ages with musical instruments strapped to their backs or carried in their arms and even children, with their instruments of choice, busking along the main street! 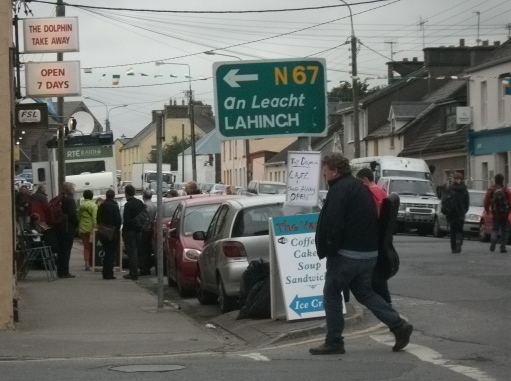 On the way back to the car, which I had parked “Irish style” (half on top of the footpath) a distance from the center of town, we were enticed into a used-book store by a Roald Dahl book displayed in the window. Eoin has discovered this irreverent and hilarious children’s book author since we’ve been in Kilkee this summer and was just telling me this very day how he hoped to get more of his books. We ended up purchasing three books, much to Eoin’s delight. However, much to my delight, there was a wooden chair for sale in the back room of the shop, hand painted and antiqued by a woman from Feakle in County Clare. 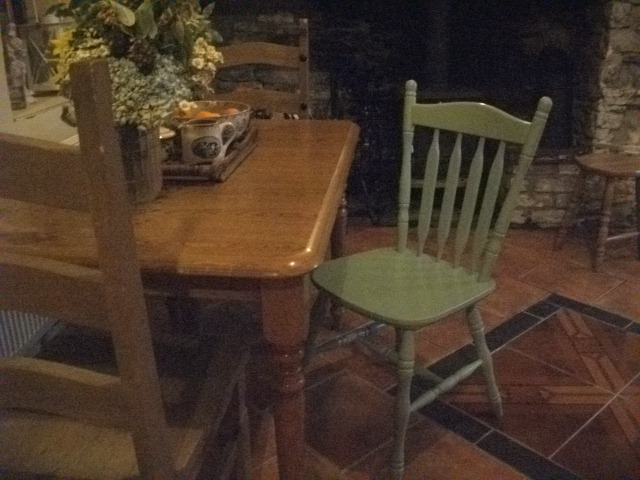 This was the chair I had pictured at my kitchen table for the past three years and, at the fair price they were asking, I couldn’t resist bringing it home! Therefore, to anyone who attended the Willie Clancy Festival today confused by the sight of a woman carrying a green, painted wooden chair above her head through the dense crowd, you see – there is a perfectly reasonable explanation! Below are a few photos we took at the Willie Clancy Fest. If you would like to see a photo of me carrying a green chair above my head down a crowded sidewalk, I’m sorry, but we didn’t take one. However, I wouldn’t be surprised if one exists in someone else’s camera! 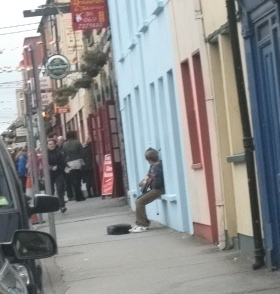 A child busking at the fest. 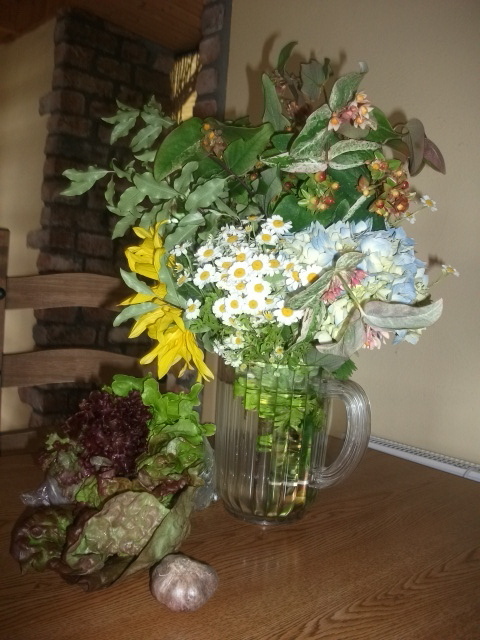 My Kilrush Farmer’s Market treasures. The Nevsail Hut at the beach. This morning, while Eoin was occupied in the Atlantic at Nevsail Watersports Camp, I enjoyed the beginning of this dry, mild day with a trip to the nearby town of Kilrush. After a leisurely breakfast of coffee and a scone at my favorite Kilrush hangout, The Potter’s Hand Café, I followed up with a visit to the farmer’s market in the square. Much to my surprise, not only did this market have the usual stalls selling such things as fresh produce, gorgeous flowers, homemade jams and local cheeses, it also had a vendor selling live chickens! After making my purchases, no chickens included, I took my time walking back to the car enjoying the warmth of the sun and imagining myself, produce and beautiful bouquet in hand, strolling through a village in the south of France! After collecting Eoin at the end of Nevsail (where a seagull ate his lunch – but that’s another story!) 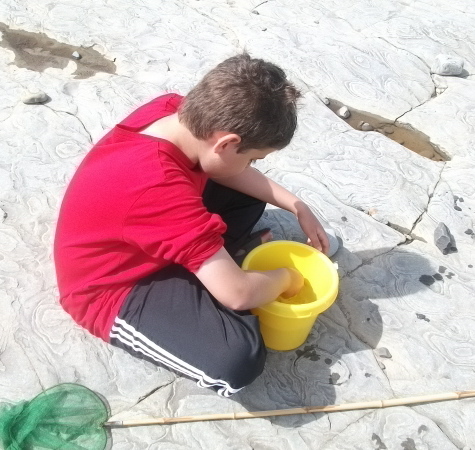 we headed over to Diamond Rocks where I took a walk along the cliffs as Eoin, carrying his net and bucket, enjoyed the mild breeze and sun while searching the Pollock Holes for sea creatures. Unlike last night, the only thunder I heard today was the sound of white, foamy waves pounding against the sun-warmed rocks beneath the cliffs. The cliff walk was a dazzling sight with the bright sun shining down from a sky of blue, highlighting a show of wild grasses in every shade of green sprinkled with tiny wildflowers of purple, yellow and white. This vibrant scene practically took my breath away after so many rainy days of muted colors under grey skies. And standing atop the highest cliff looking across Intrinsic Bay, with the warmth of the sun allowing me to finally remove my sweater for the first time in many days, there was no reason to imagine I was anywhere other than the west of Ireland! 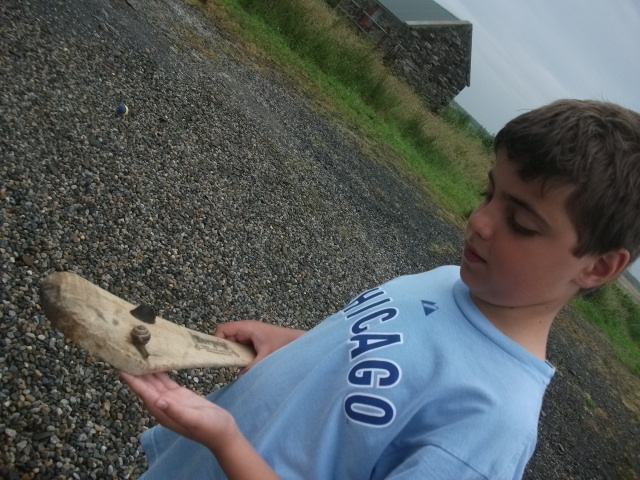 On the Loop Head Peninsula, neighbors-bearing-gifts bring a sample of their catch-of-the-day! This was our delightful surprise yesterday evening when the friendly couple we met last week, as they walked their dogs up our quiet road, followed through on their promise to bring us some fresh fish. A pleasant surprise was much appreciated in a summer that has so far brought some disappointment. I’ve already written about the changes made to the Kilkee Cliffs, which I am still troubling myself over, but two other setbacks greeted us as well. First was the sad news that Eoin would not be experiencing any horseback riding at Pony Adventures Kilkee this year because it has closed up shop! 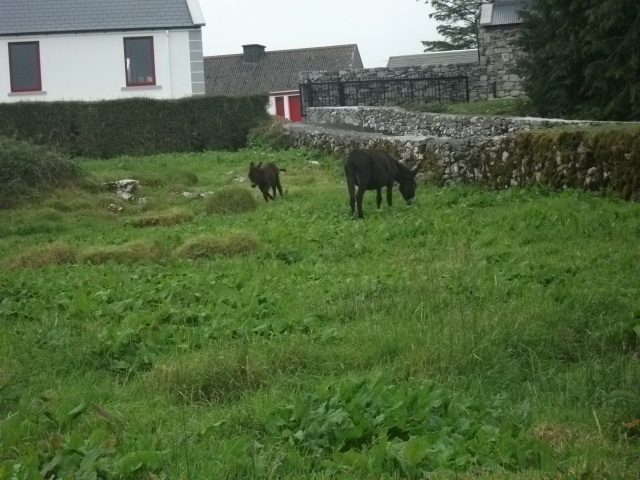 Not only was this a disappointment for Eoin, who discovered a real love and enthusiasm for the ponies last year, but it was operated by two very nice people and we will miss their acquaintance during our stay this summer. 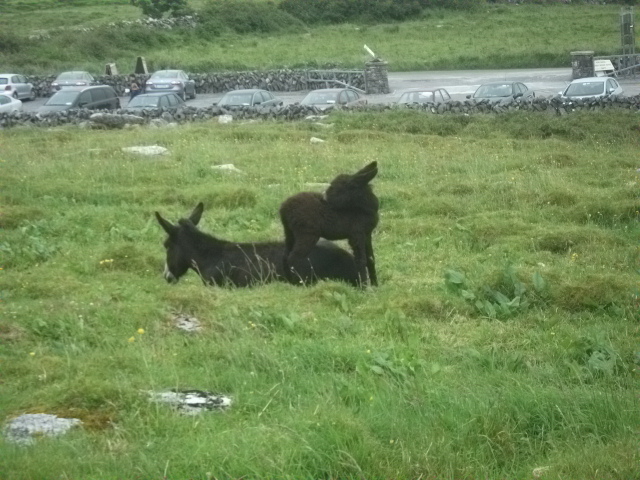 The second blow came when I made my first trip to Doolin a couple of days after our arrival in Kilkee. Doolin is known for its pubs and their traditional Irish music and many years ago served as my doorway to County Clare, so it holds a special place in my heart. Although traveling these days with a young son in tow offers little opportunity for pub nightlife, two years ago I discovered a new reason to frequent the little town of Doolin – the Magnetic Music Cafe, which I wrote a bit about in an earlier post. Much to my dismay, and Eoin’s evil 10-year-old amusement, there is now a sign on the door stating that the cafe is closed for renovation and will not reopen until next summer! Oh, how I will miss its cozy atmosphere and the best rhubarb crumble I’ve ever tasted! But if I’ve learned anything over the past two years it is that each summer I am lucky enough to spend in the Wild West of Ireland holds its own discoveries and delights. 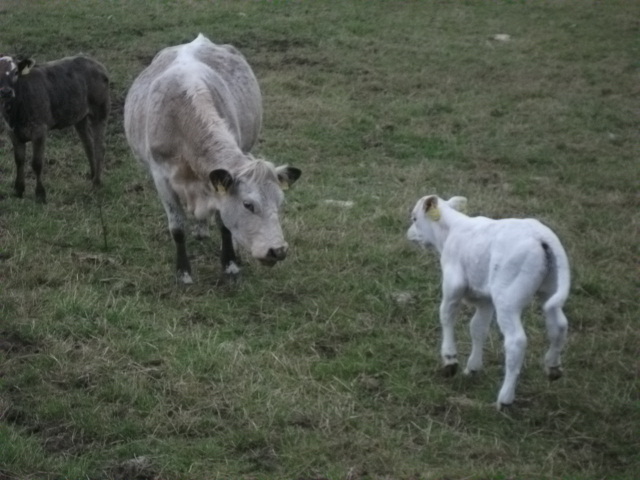 So instead of worrying over changes or disappointments, I am welcoming this summer’s unique surprises – like meeting friendly neighbors along our quiet country road! 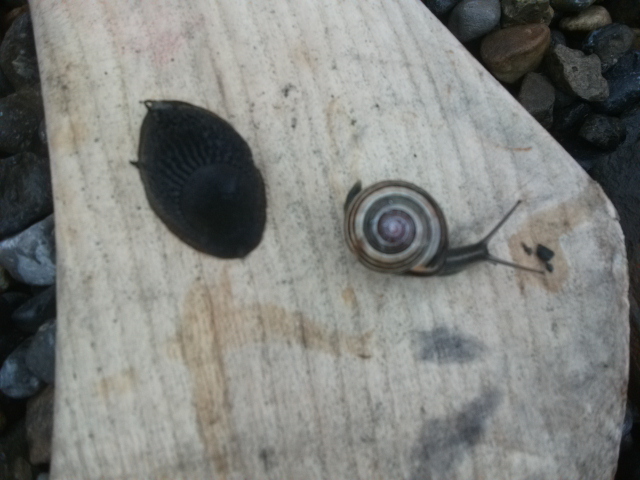 In fact, another great surprise of our summer so far was also thanks to a friendly neighbor. The man who is good enough to check in on our cottage for us while we are away granted me the best surprise I could have asked for – a clean, welcoming house complete with beds made, staples in the refrigerator and fresh-cut flowers on our kitchen table! I must admit that up until I set foot in the door of Teach de Búrca I had been absolutely dreading what horrors might be awaiting us inside a cottage that sat empty all winter long. But I was truly relieved and delighted with the lovely welcome we found instead! 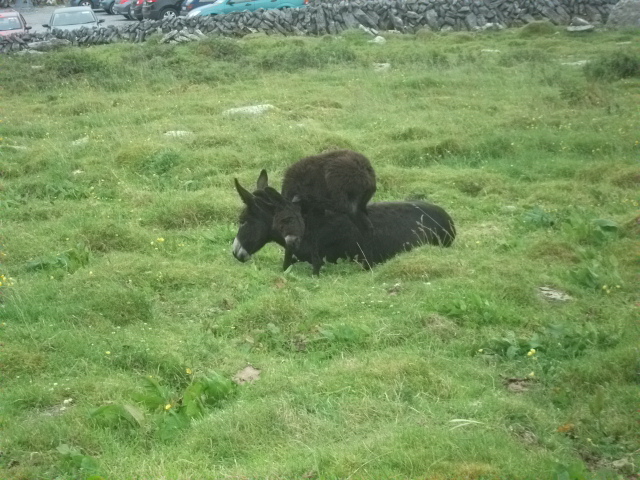 If all else fails… climb on Mom’s back! The boreen leading to Tullycrine Holy Well and the Children's Fort. 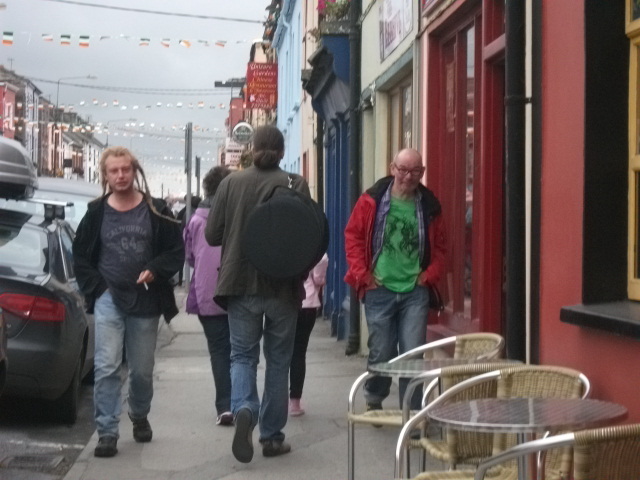 Although it was a grey, rather dreary looking day in Kilkee, the weather was mild and calm with no rain to speak of. 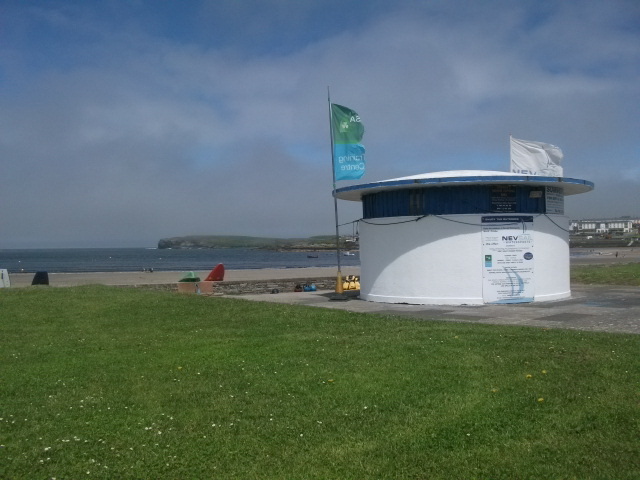 The mild weather, along with it being a weekend in late July, had Kilkee doing a great impression of the Wisconsin Dells. Rows of cars crept through O’Curry Street, filled with families geared up for their holiday in this summertime resort town. For me, it was a good time to leave in search of quieter surroundings. With no place in particular in mind we made a journey to Killimer, a town on the Shannon River, so that Eoin could watch the Shannon Ferries carry people and their cars back and forth across the wide river between County Clare and County Kerry. Like many loosely planned journeys, this one presented an interesting side trip. 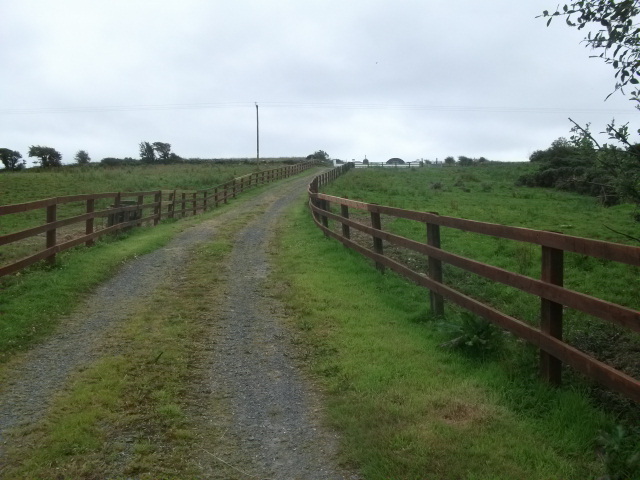 Taking the long route to Killimer and driving through the townland of Tullycrine in Kilmurry-McMahon, I spotted a brown sign pointing the way to a holy well and “children’s burial ground”. This piqued my interest so I made a quick right turn and ventured down along a quiet, narrow country road, eventually locating our unplanned destination. 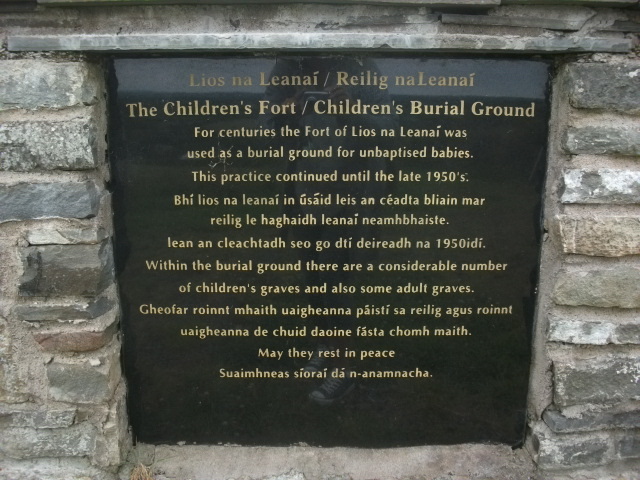 The sign at the gate indicated that we had arrived at what appeared to be two sites in one, the Tullycrine Blessed Well and Lios na Leanaí, the Children’s Fort/Burial Ground. 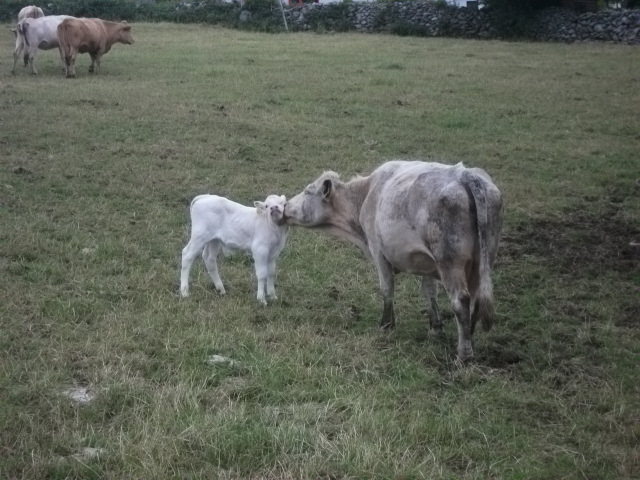 The area was deserted and very quiet, except for the sound of cows in a nearby field. After opening the gate we made our way up an incline walking along a gravel boreen to the holy well. This particular well came complete with holy statues and even a couple of kneelers. Ignore the reflection of my Converse All Stars at the bottom of the sign! There was no sign explaining the significance of the Tullycrine Holy Well. However, like most holy wells, this was likely once a sacred pagan well, eventually acquired and renamed by the Christians as they tried to replace the old ways with the “new”. Beyond the well, there was another gate and a walk further up the hill where we found the signs, topped by a large marble Celtic Cross, indicating the Children’s Burial Ground. As I suspected, this was a place where, for centuries and up until the late 1950’s, unbaptized babies were buried, along with a few adults who, for one reason or another, were not buried on Church holy ground. Venturing past the signs and the gate, I was quite surprised to see that, if I am not mistaken, the burial ground lies within what appeared to me to be one of the many ancient ring forts found around Ireland. 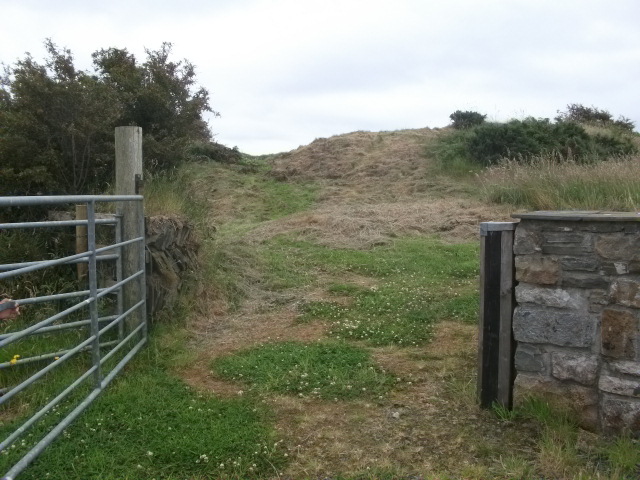 Gate and path to the top of the mound surrounding the Children's Burial Ground. 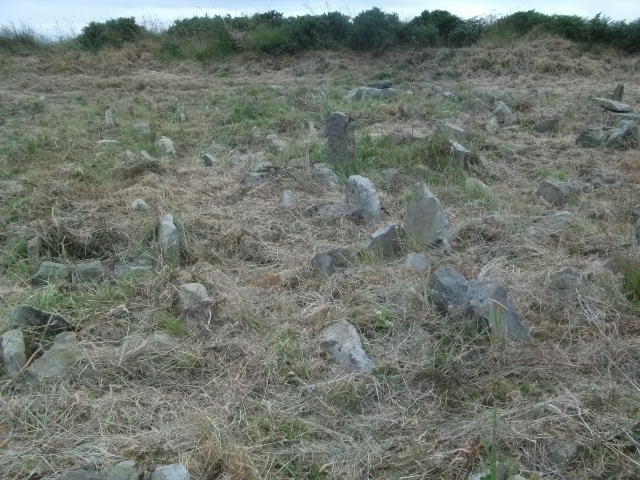 After climbing up the side of the mound and looking within, it was startling to see the bleak and very rough sight of dozens of oddly shaped stones that at first appeared to be randomly laying about. 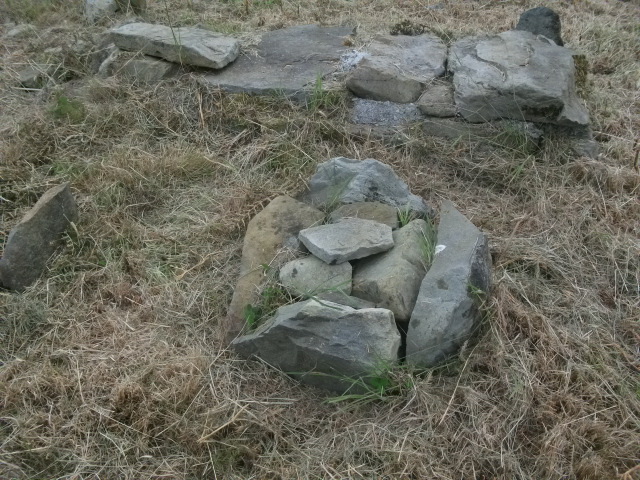 However, upon closer inspection I realized that most of the stones were actually stacked very thoughtfully, to form tiny graves. This poignant sight brought a heavy wave of sadness and regret over me and touched Eoin as well. It was heart-rending to ponder the parents who so tenderly arranged these rocks around the graves of their children in such a lonely place. 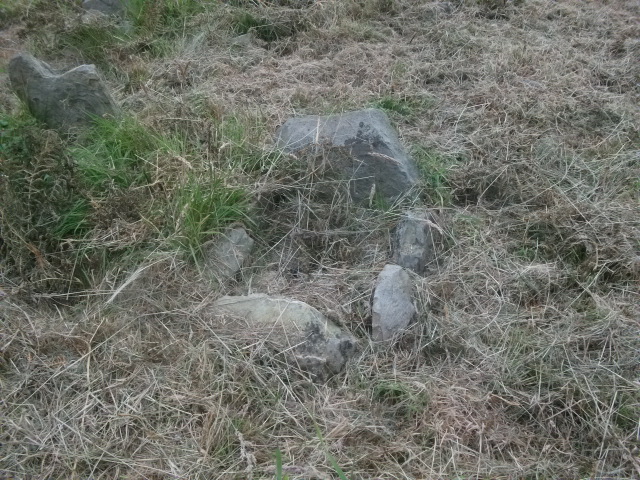 Below are photos of the site and just a few of the tiny graves. 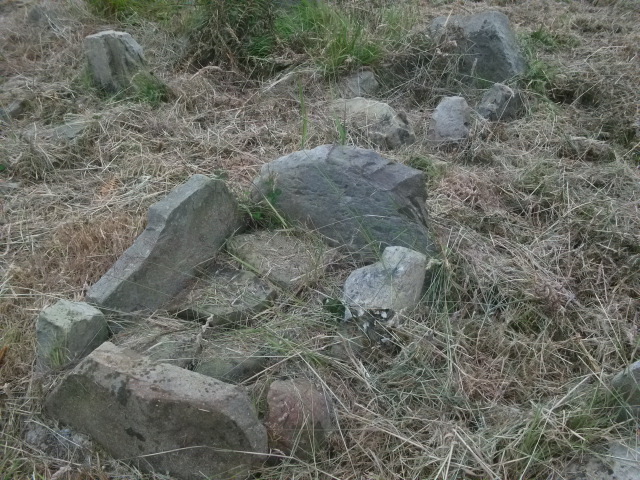 At first it appeared to be stones just laying randomly about.